RICHMOND, Ky. — It’s common to see healthcare employees wearing scrubs. What used to be reserved for doctors and nurses is now even worn by front desk staff. In recent surveys, the wearing of scrubs was key to patient care perception. However, too many colors and styles have made the use of scrubs confusing to patients and frustrating for laundries. Today, more healthcare facilities are moving toward scrub programs to make staff more identifiable and to make processing easier. Janice Larson, vice president of clinic resources and consulting for Encompass Group, explored this topic during the Association for Linen Management’s (ALM) webinar titled Hospital Trends: How Uniform Programs Affect Patient Outcomes. In addition, American Laundry News received input from two textile manufacturers and distributors on changing scrub materials and styles. Larson says that scrubs were first worn by doctors in the operating room (OR). From there, wearing scrubs spread to OR nurses. By the 1980s, scrubs had spread to the rest of the hospital, she says. Because of the widespread use of scrubs and the cost pressure of providing and maintaining them, processing began to change. On-premises laundries (OPLs) started to close, according to Larson, and processing moved to commercial laundries. Scrubs in departments other than a critical few, such as the OR and central sterile services, were then purchased and laundered by the employees. While wearing scrubs made life easy for healthcare employees, problems began to appear when it came to the patients. “Patient satisfaction surveys started to show that patients had difficulty identifying staff,” Larson says. She shared one scrub color-code list from a healthcare provider that had color instructions for a mind-boggling 18 departments. A 2012 University of Pennsylvania study on registered nurses (RN) and 60 patients showed that professional status and quality care is linked to uniform style and color, says Larson. Almost 80% of the patients said they felt it was important to identify the RN. The problem was that 43% couldn’t identify them. Uniform color was the preferred identification method, but patients didn’t know the color code. A 2013 study by Vestagen Technical Textiles Inc. confirmed the color-coding preference. “Of patients and family members surveyed, 89% said it would be helpful if the scrubs were color-coded by role,” Larson says. However, she also says the study showed that having between four and eight colors was optimum for a program. The top four roles that participants said should be color-coded were nurses, doctors, housekeeping and laboratory employees. Color-coded scrub programs are widespread today, says Larson. An informal survey of 600 nurses showed that more than 60% of respondents said that their facility had a designated, color-coded scrub program. The most common color worn by the nurse respondents was blue, at 59%. Other common colors were black, white, green, gray and purple. Larson says that there are several reasons a color-coded scrub program is a positive thing. For one, the healthcare administration sees the program as presenting a more professional image. The departments within the facility become easily identifiable and distinguishable for staff, patients and visitors. And Larson says it can be part of the hospital’s or health system’s branding initiative. The cons related to scrub programs? 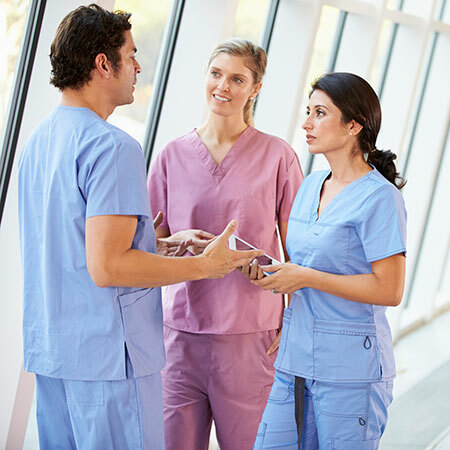 As healthcare institutions adopt and adapt color-coded scrubs initiatives, manufacturers are also keeping pace with scrubs styles and materials, which can be beneficial to laundries. Scott Delin, vice president of healthcare sales for Fashion Seal Healthcare in Seminole, Fla., sees a few other factors influencing the scrub market. With this change, Delin says, the styling of uniforms is changing as well. He says that “less intimidating” and more retail-inspired styles are being sought out by the everyday employee. Steve Kallenbach, director of market solutions for ADI American Dawn in Los Angeles, says that new fabric types help extend the life of scrubs and other healthcare textiles. “Any product in spun poly versus a blend will last longer—in shape, fading, shrinking and weight,” he adds. Another area of change that Delin sees happening is more laundries looking to direct-sell in an effort to offer a more branded and consistent look within a facility. As scrubs change in materials and styles, and scrub color-coding programs continue, it’s important that healthcare facilities keep in mind patient perception, along with laundry processing needs. Matt Poe is editor of American Laundry News. He can be reached at mpoe@atmags.com or 866-942-5694.